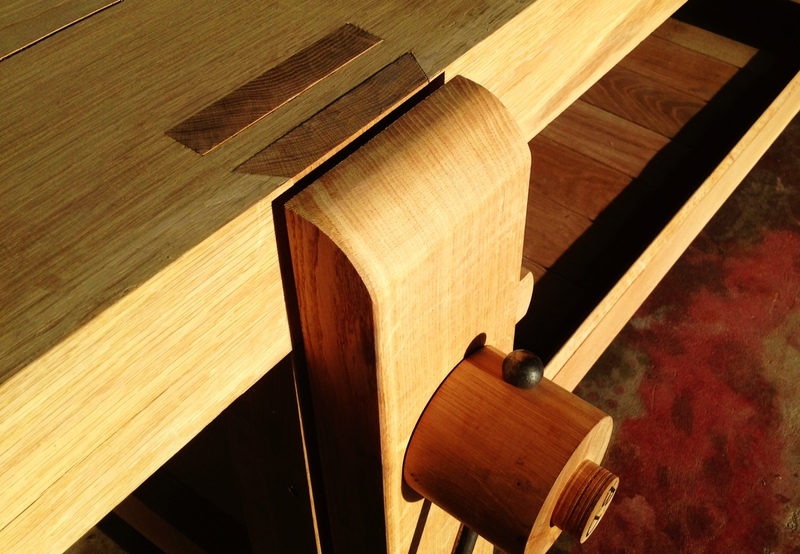 In July 2013 I participated in an event that changed the course of my woodworking endeavors. At the time, my “workbench” was a four foot square table made from 2×6’s topped with plywood and hardboard. It was originally made to pack electrical parts for shipping, and it’s most charming elements were the dirty pictures drawn here and there. 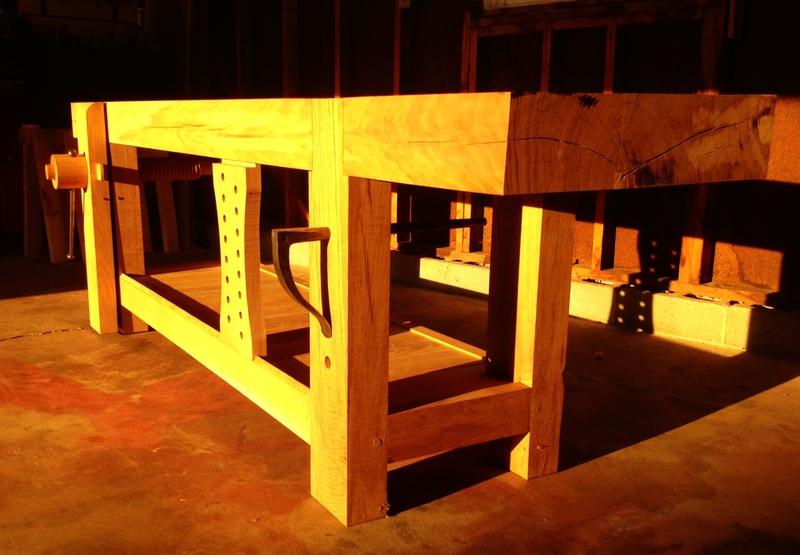 At the time, I was in the process of determining if I wanted to build or purchase a functional workbench. Since my heart was into making furniture, I was not particularly excited about spending the time needed to make a quality bench. But I knew that I needed a better solution for work holding to become more efficient in the shop. 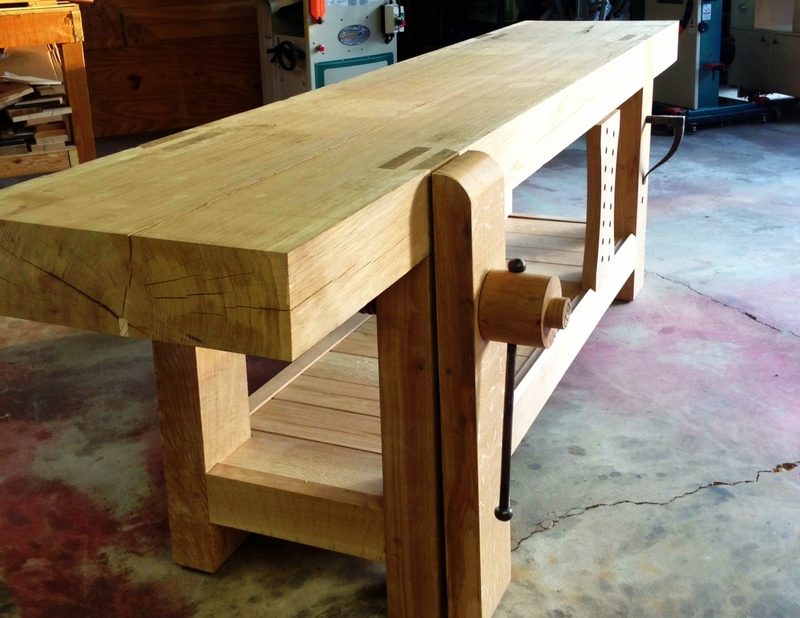 In late February 2013 I stumbled across a post on the Benchcrafted blog about an event being organized to make benches exactly as detailed on Roubo’s Plate 11, headed up by some world class woodworkers, thinkers and makers. I sent the link to Nicole, for no other reason than just share information about such a fascinating project. She replied back a short time later and said it looked like an opportunity that may never happen again and why hadn’t I signed up yet? I was shocked! I immediately sent a note to Jameel at Benchcrafted – the post was a day old and the project was only open to 10 folks, so I was concerned that I was too late. A few anxious hours later, Jameel replied back and said that I had made the request in time, and he would be sending more information out in the coming weeks. Whew! The reality is that as you get older, you don’t generally get as excited the same way you did as a kid or young adult. As it does for many, woodworking had become a bit of an obsession – and outside of the birth of my daughter, the anticipation for the French Oak Roubo Project over the next four months was perhaps the most excitement I had felt in my adult life. That was one of the biggest thrills of the event. The project week finally came, and as expected the experience was incredible. The cast of characters involved of course made the event, and working in harmony with all in the spirit of Roubo made for an experience that will last the rest of my life. Of course you know you are someplace special when Jeff Miller and Don Williams are making jigs for the project! The essence of the event was wonderfully captured on Jameel’s documentary found here. I had every intention of bringing a finished bench home, but in reality none of the participants were able to get to the point of assembly by the end of the event. So over the next several weeks I was able to slow the pace and think clearly through the details. 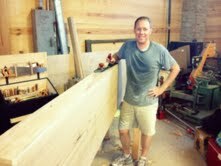 It all lead to the day the bench came together – a few seconds of pure woodworking bliss captured here. And this is how 80+ Roubo legs and chops are milled! 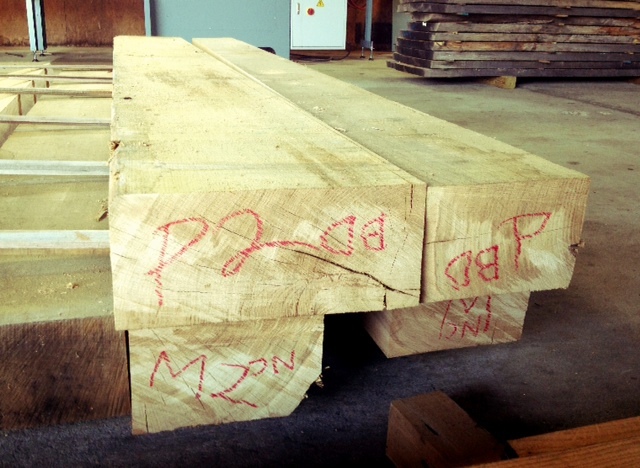 In all there were 16 benches initiated during the French Oak Roubo Project, including Bo Child’s 16 foot beast. And it appears that there is going to be a FORP II in late 2015! Thanks much for your post and congrats on your bench. I’m headed to Wyatt’s place for next month’s build and am so excited I can hardly think about anything else. Any thoughts for this years participants? Is there anything you would absolutely do again or recommend that we avoid? You are in for a fantastic experience! Really wouldn’t change anything – you’re being guided by the best minds in the biz, who now have the opportunity to refine the process going through a second time. Our group was pretty efficient, the first half of the week was a group effort getting tops and legs milled, and helping those with two part tops (like mine) with the glue up. The last two+ days was mostly individual work on our own benches. Sturdy saw horses – At the build there were plenty of folks around to help flip your top as you worked on it. Once I got the bench home I had to do it on my own using a clamp as lever to flip up and lower. You definitely want some sturdy/wide horses to do this – the weight of the slab top is no joke! Big chisel – it is great to have a nice wide chisel that you don’t mind pounding on to clear out the double dovetail mortises. The oak is tough stuff. I used a 1.5″ chisel, but would recommend going with a 2″ if you have one. Dovetail mortise angle cuts – some of us used a track saw to cut the angle of dovetail mortise. I didn’t get my cuts dead on -fortunately I was cautious and hit the inside of the line – but had to do a lot of chisel work. I think if you used a handsaw to cut these angles, it would be much more accurate from the start and the chiseling is just finesse work. 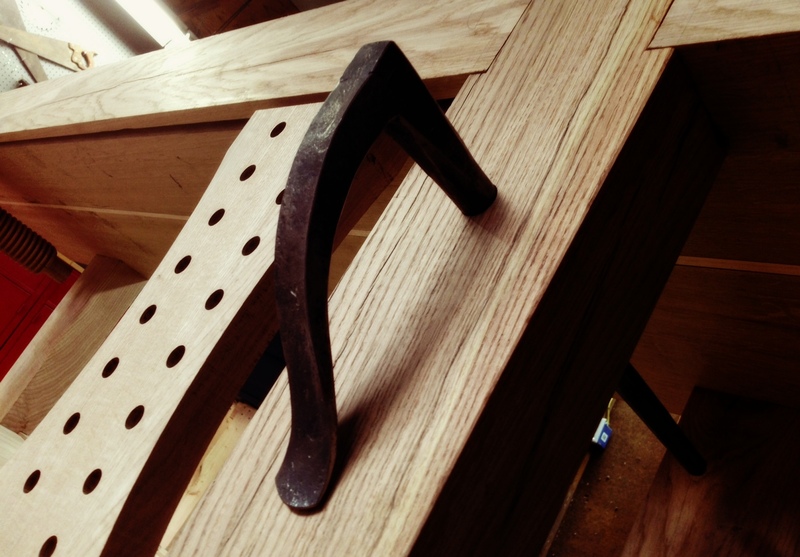 Mortise jig – Jameel fabricated a router jig for the inside mortises. I used it from both sides, and just had an inch or so of wood to clear from the middle. Worked fantastic. Sliding Deadman – if you are going to install a sliding deadman (I did and use it frequently), I think it is best and easiest to route the groove before everything is assembled and when all the parts are square. Quick Assembly – Several of us had our benches assembled within a few weeks of the build. Sounded like those who waited longer had to deal with a lot of wood movement. You can eliminate these complications by getting it together quickly if your schedule allows. Hopefully more FORP II benches can actually get assembled during the week of the build. It would be incredible to see several of them lined up! Have a great time, I will certainly be following along from afar!